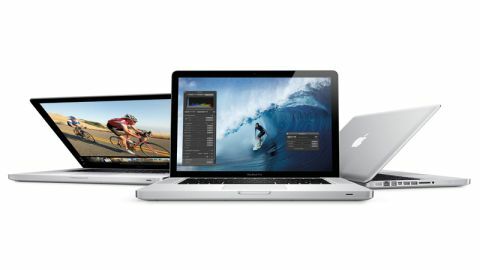 Apple's mid-2012 MacBook Pro update isn't all about the Retina display. As well as introducing its top-of-the-range Apple MacBook Pro with Retina display, Apple also refreshed its regular MacBook Pro range. The two 13-inch MacBook Pros and two 15-inch MacBook Pros were upgraded, but the 17-inch MacBook Pro was discontinued. Standard, off the shelf prices for the 15-inch MacBook Pros are the same as for the previous generation, with the cheaper 2.3GHz 15-inch MacBook Pro costing £1,499 in the UK or $1,799 in the US and the more expensive 2.6GHz 15-inch Apple notebook going for £1,799/$2,199. On paper, the 15-inch MacBook Pro mid-2012 refresh is a minor update. The new non-Retina 15-inch MacBook Pros use the same form factor as their late 2011 predecessors, looking outwardly identical. The same unibody enclosure is used, whereby the body of the notebook is milled from a single block of aluminium, giving great strength without adding weight. The screen is the same 15.4-inch LED-backlit display as before, the 720p FaceTime camera is unchanged and the keyboard still lights up in the dark for ease of typing. All the changes made to the 15-inch Apple MacBook Pro are under the hood. The processors have had a minor speed bump, but the upgrade is more significant than a comparison of their relative clock speeds implies. The new chips are Intel's third-generation Ivy Bridge processors, where the previous generation of MacBook Pros used second-generation Sandy Bridge CPUs. These new processors boast upgraded integrated graphics. The discrete graphics processors have also been upgraded, to the latest Nvidia GPUs. Faster onboard memory is used, too. Unlike the new 15-inch MacBook Pro with Retina display, which features a completely new design focused on creating a thinner, lighter version of the MacBook Pro, the regular 2012 15-inch MacBook Pros retain their optical drives. Storage remains faithful to the hard drive format, which offers significant advantages in terms of cost and capacity, but can't match the speed and lightness of the Retina display MacBook Pro's solid state drives. Connectivity is very much the same as before, with Thunderbolt, FireWire 800, Gigabit Ethernet and USB catered for, although the two USB ports are now USB 3.0. In common with most Macs, the new Apple MacBook Pros can be upgraded and customised if you order online through Apple's website. You can add more memory to the cheaper of the two 15-inch MacBook Pros, and boost the processor of the more expensive model. The storage drive can be upgraded in either version, to a bigger hard drive or a solid state drive, and you can opt for a 1680 x 1050 high-resolution glossy or anti-glare screen on whichever 15-inch MacBook Pro you choose. While the new MacBook Pro with Retina screen is undoubtedly the mid-2012 refresh's headline-grabber, the regular 15-inch MacBook Pros have distinct advantages of their own. As well as being cheaper, they're far more upgradeable than the Retina notebook, which offers few customisation options. If you need an optical drive, the regular MacBook Pros retain the built-in SuperDrive, and the hard drive (which can be replaced or upgraded by you) offers greater onboard storage capacities. If you're prepared to put up with the extra weight and don't need the Retina screen, a regular 15-inch MacBook Pro could be just what you're looking for. But what does it offer by way of performance and specifications? Let's take a look.